Director/Producer – Edward J. Montagne, Screenplay – Jim Fritzell & Everett Greenbaum, Photography – Rexford Wimpy, Music – Vic Mizzy, Music Supervisor – Joseph Gershenson, Matte Supervisor – Albert Whitlock, Makeup – Bud Westmore, Art Direction – William O. deCinces & Alexander Golitzen. Production Company – Universal. Roy Fleming, an employee at a children’s amusement park rocketship simulation in Sweetwater, Missouri, receives a letter informing him that he has been selected by NASA as an astronaut. Roy does not want to be accepted because he is afraid of heights but his father refuses to listen to his objections. However, when Roy arrives at NASA he finds that he has been selected not as an astronaut but as a janitor. Everybody back home seems so proud of him that Roy feels unable to disappoint them by telling the truth. NASA then steps up its campaign to beat the Russians by being the first to send an automated rocket into orbit. In order to demonstrate the ease of the automated rocket, they decide to send up the least likely candidate and Roy finds himself selected as an astronaut. With the arrival of the Space Age, trailing not far behind came various comedy interpretations. Most of the comics of the era eventually made at least one trip into space – Abbott and Costello in Abbott and Costello Go to Mars (1953), The Three Stooges in Have Rocket, Will Travel (1958) and The Three Stooges in Orbit (1962), Norman Wisdom in The Bulldog Breed (1960), Bob Hope and Bing Crosby in The Road to Hong Kong (1962), Frankie Avalon in Sergeant Deadhead (1965), Jerry Lewis in Way … Way Out (1966) and Don Knotts here. Even Doris Day underwent comic shenanigans at a NASA facility in The Glass Bottom Boat (1966) and Soupy Sales in Birds Do It (1966), although neither of these venture into orbit. Most of these films centre around the concept of idiots (usually accidentally) being launched into space. 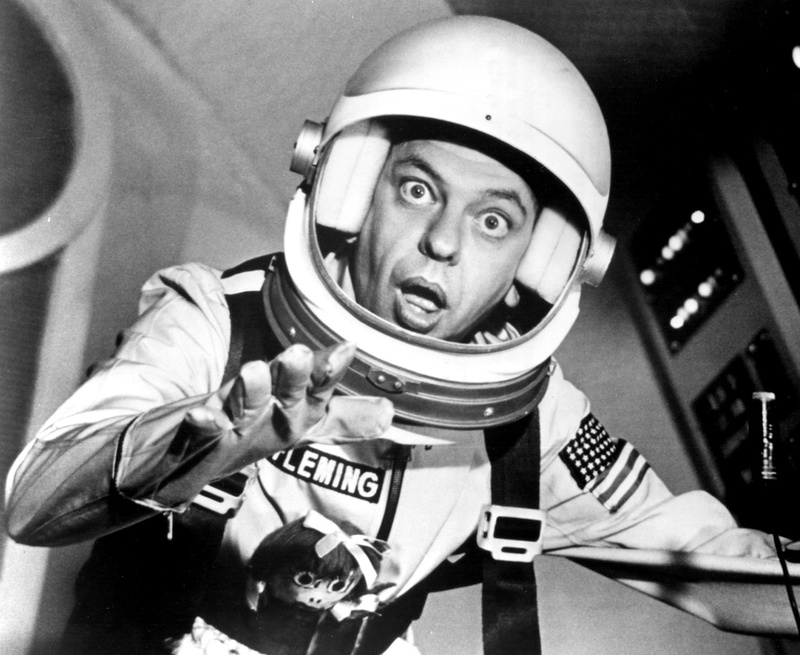 The Reluctant Astronaut was a vehicle for comedian Don Knotts. Don Knotts was a stand-up comic from the early era of live-television who had found fame as Deputy Barney Fife on The Andy Griffith Show (1960-8). Knotts starred in a handful of films throughout the 1960s – The Incredible Mr Limpet (1964), The Ghost and Mr. Chicken (1966) and The Shakiest Gun in the West (1968). The Reluctant Astronaut is a hardly inspiring entry in this comedic space launch mini-genre. It is not even, for the most part, a space launch comedy, more so a series of knockabout antics at a space launch center. 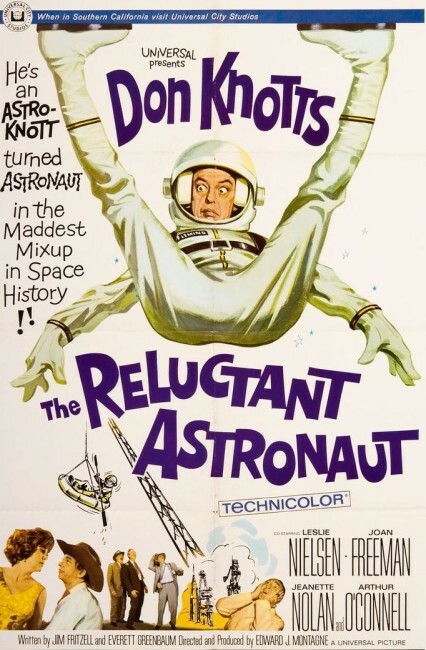 The greater part of the comedy in fact seems to centre around the scarcely electrifying theme of Don Knotts’ inability to tell friends and family that he is only a janitor and not an astronaut and the confusions that result. There are a good many lacklustre slapstick scenes set around Knotts slapping people in the face with a mop over his shoulder, bumbling into wind tunnels and rocket sleds, turning on the air conditioning inside a space suit and so forth. There is much here that could have been hysterical if enacted by say a Charlie Chaplin or even a Jerry Lewis, but the film’s criminal mistake is to never keep pushing the gags to a necessary level of surreal dementia or agony. The bug-eyed, elastic-faced Don Knotts gives a performance that almost entirely consists of hapless hangdog double-takes. Where the film does actually briefly become funny is during the space launch in the last fifteen minutes, which features the appealing image of Don Knotts sitting in a chair and grabbing crackers as they float past then reaching out to spread them with floating squirts of peanut butter.